To find parking real-estate in San Francisco especially in the tourist areas is something to celebrate. 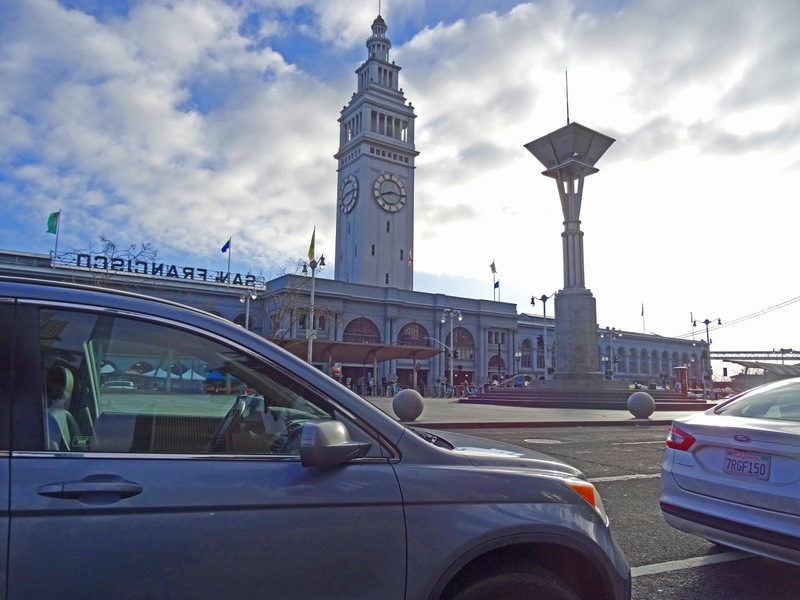 We parked right across the street from the Ferry Plaza Farmers Market which proves that yours truly, truly has good parking karma. We also found some of the first Asparagus of the season. Life is Grand. It was a dark and stormy night. Actually it has been raining constantly for weeks. 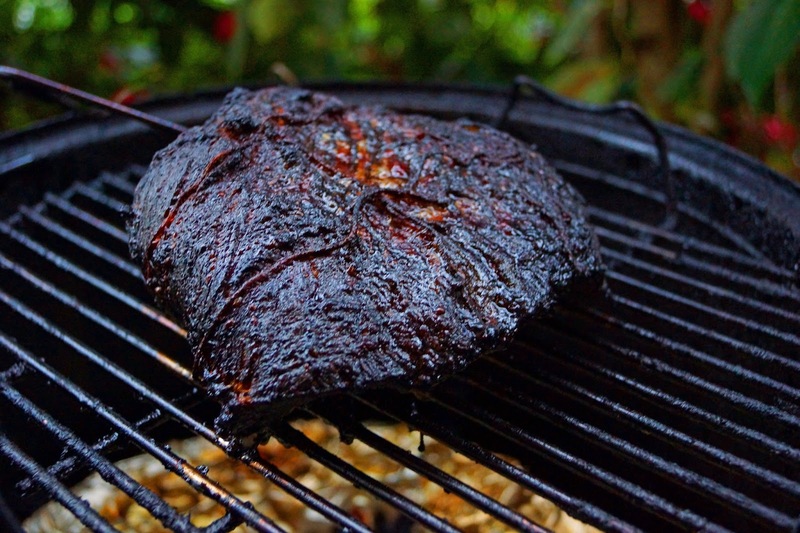 The barbeque has been idle but we still crave beautiful bbq flavor. 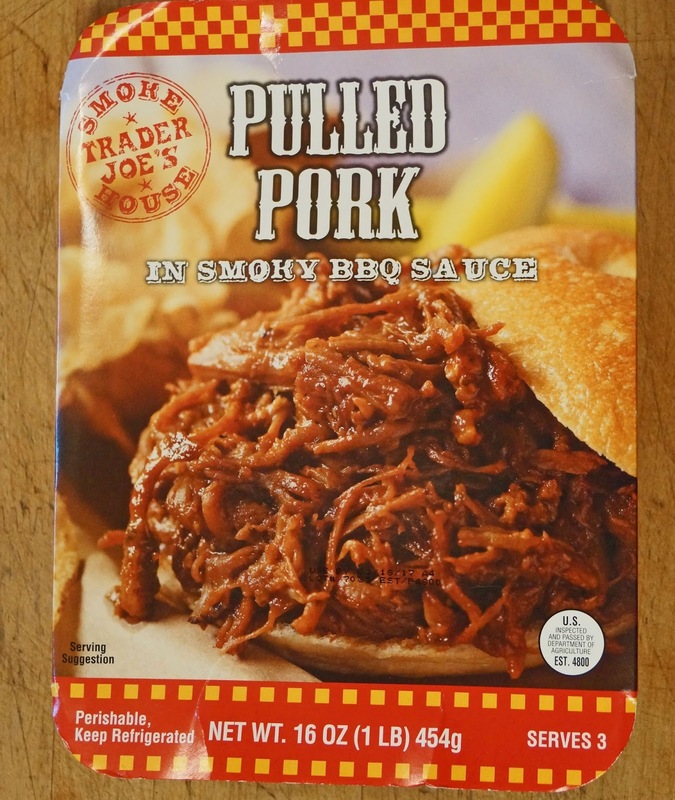 Trader Joe's (The store that has everything you have always wanted but don't need) has a convenient product of pulled pork. It comes in a sixteen ounce microwavable serving container. This prepared product set us back six dollars. It claims to serve three and boasts it will satisfy all kinds of bbq aficionados. Aficionado or bbq freak may be appropriate. 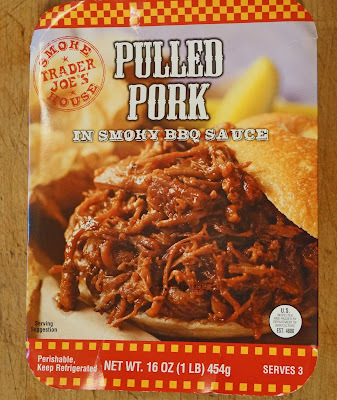 This is made in Texas; "with a sweet & smoky sauce that screams Kansas City, this is bbq Trader Joe's style.". I could not help myself and read the ingredient list. Surprisingly it was basically all the ingredients that are used to make pulled pork. I was expecting a lot of chemicals, by products, liquid smoke and gosh knows what. This ingredient list gave me hope. We followed the instructions which basically was put in microwave and heat. This meat mixture was placed on a toasted jalapeno, cheese and mustard slathered bagel. Drum-roll please. The million dollar question is how does it taste? 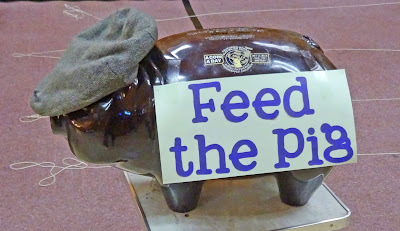 I have tasted, sampled and scored hundreds of offerings of smoked pulled pork. 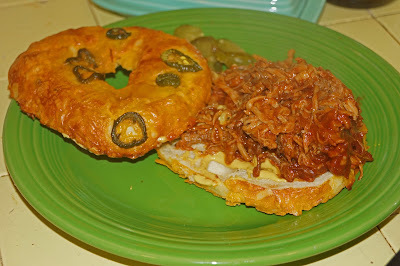 My first initial reaction to the flavor of our pulled pork was the prevalent taste of sweet bbq sauce. Is this a bad thing? Not necessarily but I like to taste the pork. My next observation was the texture. The meat was very soft. There was a lot of pulled thin pieces of meat with a few larger chunks. 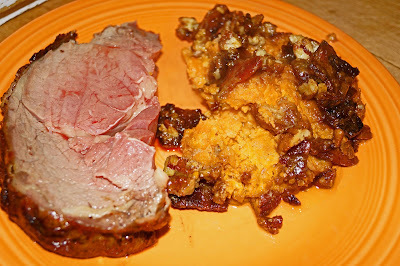 The larger chunks had a little texture but on a whole I would consider this meat overdone. The smoke presence was slight. This product might appeal to a certain audience. The price is very reasonable. This product is uber convenient to prepare. Would I purchase this again? No. In my opinion, this was overly sauced with a too sweet bbq sauce masking pork flavor. The meat was overdone to my liking. This product was not terrible and I am sticking to that. Trader Joe's offers other offerings of brisket & chicken. Hopefully it will stop raining. A great meal is made up from the sum of its parts. I just butchered a saying from Aristotle but with tasty intent. 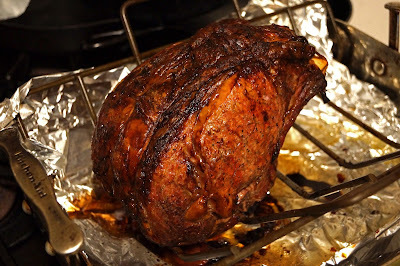 We had a wonderful marinated prime rib to roast and needed a side dish. 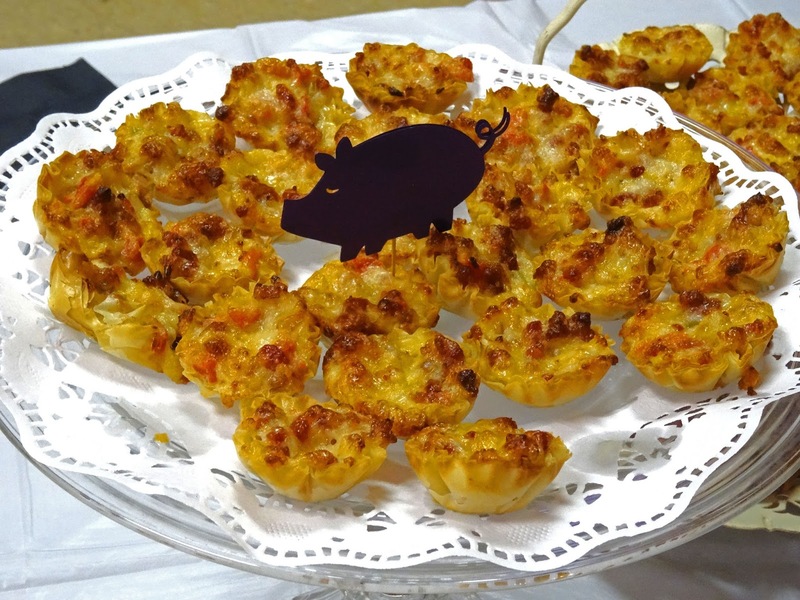 We experienced the most decadent side dish at the Elks Club Purple Pig Fundraiser that we wanted to recreate. 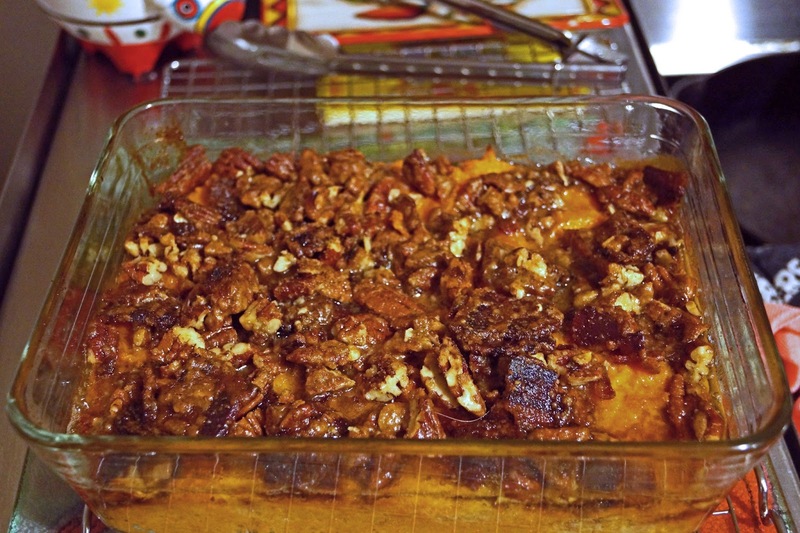 This dish was a Sweet Potato with Candied Bacon Praline Topping. We did not get the actual recipe but this one is darn toot- in close. We copied and pasted a recipe off of the World Wide Web and tweaked it to our liking. The original recipe had way too much butter and sugar. Now butter and sugar is not such a bad thing but today and today only we are using restraint. This praline topping is over the top with candied bacon, brown sugar and pecans. This dish is teetering to dessert like heights. Have a seat and let’s get cooking. We will break this recipe down into steps. The first step is to roast 2 pounds of sweet potatoes on a foil lined sheet pan in a 400 degree oven for 45 minutes. You will know they are done when you can stab them easily with a dull knife. Cool and reserve cooked sweet potatoes. 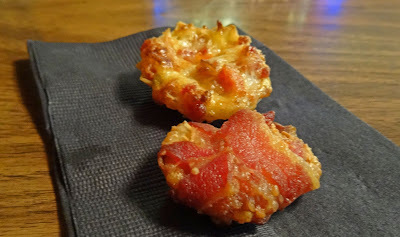 The next step is to candy some bacon. Make a slurry of 3 tablespoons of maple syrup and 3 tablespoons of brown sugar. Lightly oil another foil lined baking sheet. Coat 4-6 slices of bacon with slurry and place on oiled foil lined baking sheet. Thank me for foil lining your baking sheet. This gets very sticky after baking for 30 minutes in a 350 oven. 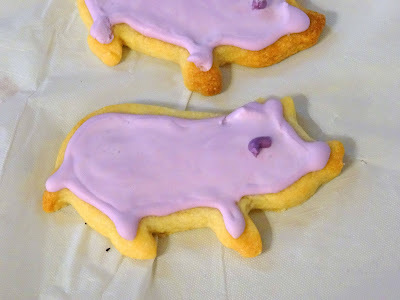 Let cool and try not to eat them because this will go with the topping. We are almost ready to assemble. Let’s start with the vessel. An 8 by 11 well oiled baking dish will work. The sweet potato base will comprise of three beaten eggs, ½ cup of evaporated milk, ½ cup of white sugar, ½ stick of softened butter, 1 teaspoon of salt and 1 tablespoon of vanilla extract. Combine all the ingredients and place in cooking vessel. 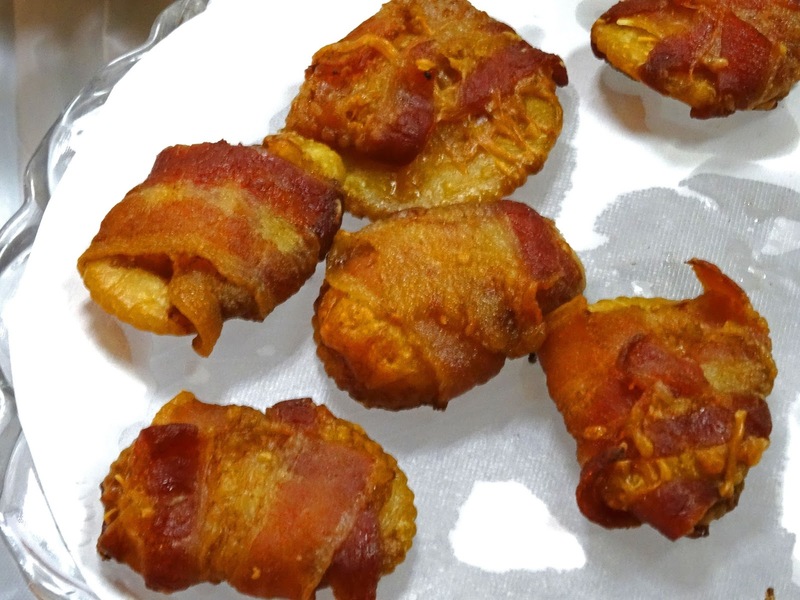 The topping comprises of ½ stick of softened butter, 1 cup of chopped pecans, 4-6 strips of coarsely chopped candied bacon,1/2 cup brown sugar, ¼ cup of flour and a pinch of salt. Combine all these ingredients and spread over sweet potato filling. Bake all for 40 minutes at 350 degrees. Easy Peasy bacon squeezy is this dish. Serve with prime rib. Needless to say this is one decadent dish. Take a recipe and tweak it to your liking. 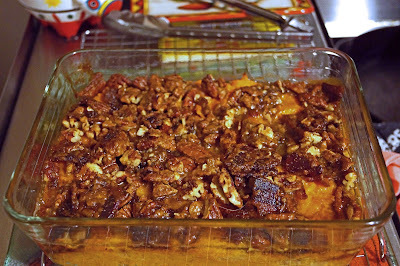 The bacon praline top makes this dish dessert like. Candied bacon? Why not? Thanks to all my Purple Pig inspirations. Have fun with this recipe and feel free to make it your own. 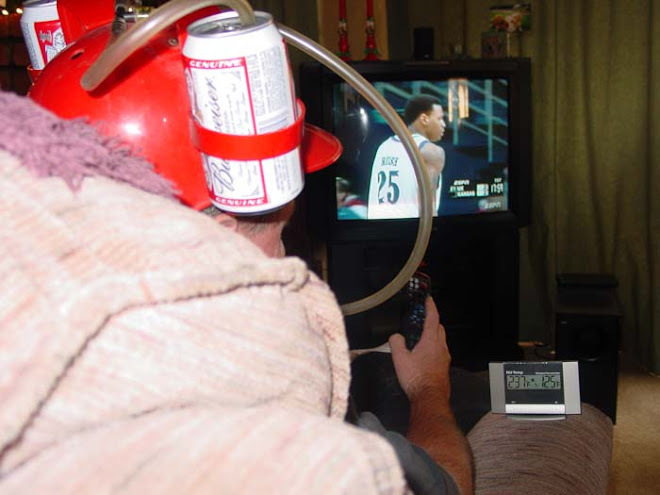 This is the future. With one push you can order Kingsford charcoal with the Kingsford Dash Button. 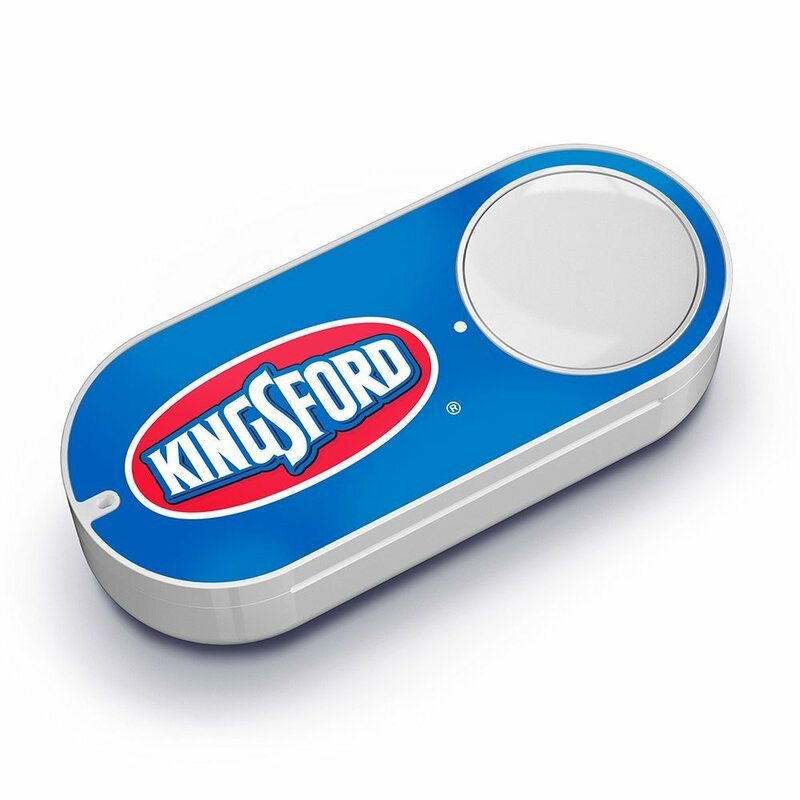 This is a wi-fi connected device that connects directly to Amazon to order Kingsford charcoal to be delivered quickly to your home. I may have to get one. Ms. Goofy gifted me a beautiful beef brisket from Brandt Beef. A whole packeris a lot of meat for just two people to eat.The packer is the whole brisket including the fatty point end and the lean flat piece.We decided to separate the point from the flat and make two separate cooks. 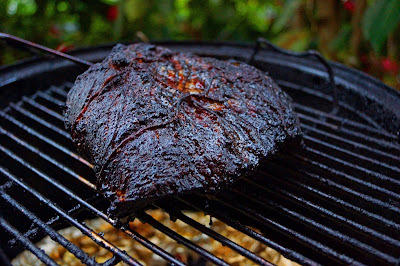 Last Superbowl weekend we cooked the point end and made some very tasty burnt ends. We do love burnt ends. Who doesn't like meat candy. We now had a large lean cut of flat end brisket for our next cook. We are going to transform this into pastrami. This is done in several steps and takes a week long preparation. The first step is to cure the beef with salt and spices. We are basically making a corned beef. 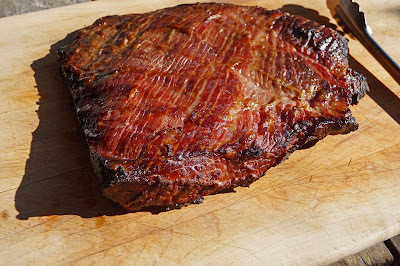 This corned beef is then cooked in a smoker and the results are some of the best pastrami ever. We used a wet brine technique for our curing. 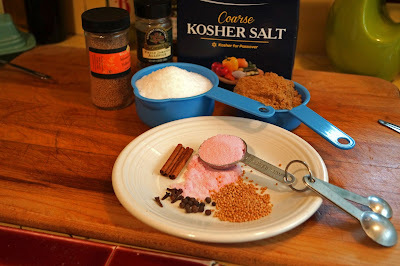 The recipe is linked at the bottom of our post. It is a very simple process of combining spices, pink salt and salt into a brine. You do need some real estate in your refrigerator to hold the brining bucket. The curing will take 5 to 7 days. We then smoked our cured meat with a combination of apple and hickory wood. It sure smelled good as the cook progressed. When our meat hit an internal temperature of 160 degrees we were ready for lift off. Of course a half hour of resting time was needed before slicing. Words have escaped me for how good this was. The smoke component of apple and hickory wood perfumed our meat to an alluring bouquet of happiness. The meat was tender. The spices complemented and were in balanced harmony. Oh my! I cannot wait for sandwiches tomorrow. A sandwich with a slather of German mustard is just what the doctor ordered. This process takes a time commitment but is so worth every morsel. 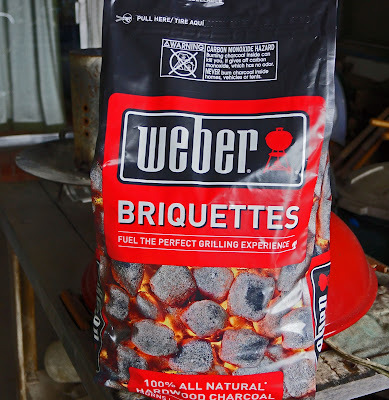 Weber has launched a new charcoal briquette. According to Weber; “In stores now, the new 20-lb. bags of Weber Briquettes are made from 100 percent, all natural hardwood that does not include any unwanted chemical binders or fillers, produce less ash, and provide a long, consistent heat requiring less need to refuel during grilling—and more time to watch the game.” As some of you may know I am a fan of all things Weber. It is time to take a bag of Weber Charcoal Briquettes on a test ride. It was easy to find this new charcoal at our local box chain hardware store. They come in shiny, re-sealable, and “weather protected” plastic bag. The price without tax was 19.99/20 pounds. Once we got home we weighed out 12 briquettes and did our un-controlled burn experiment. The first thing we noticed was these briquettes are larger and not notched like their competitors. Twelve charcoals weighed out to one pound. (Blue bag Original Kingsford weight was eight ounces.) 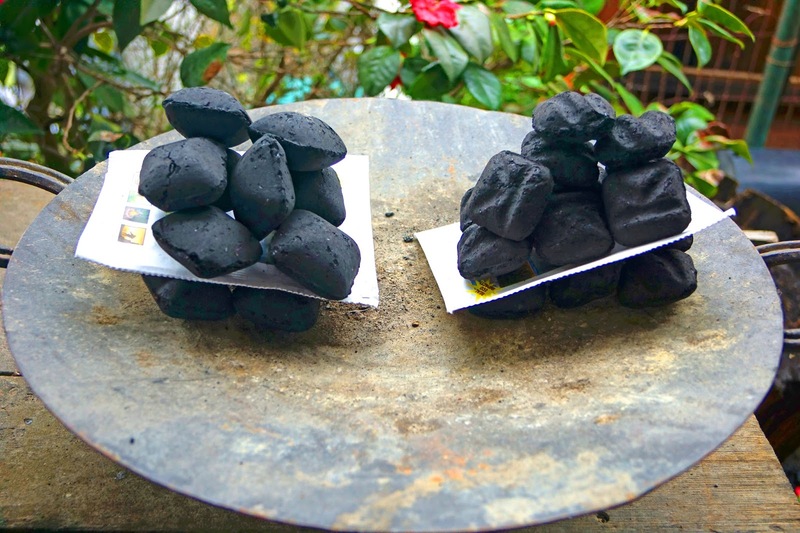 Our Weber charcoals would be lit and compared to 1 pound of Kingsford Originals briquettes. It was a damp and windy day to perform our burn experiment. Both brands of charcoals ignited at the same rate. 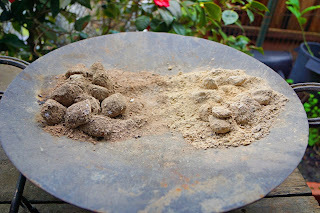 We let the briquettes burn for one and one half hour and took a look. The Weber briquettes still had a little heft and were cranking out some noticeable heat. The Kingsfords were still smoldering but pretty spent. The Weber briquettes with their larger heft and girth and hardwood materials seemed superior in this particular test. It was time for a real test of cooking. We cooked a couple of meals of a brisket point and a cowboy steak. The brisket point was cooked Super Bowl Sunday. I cooked it on a 14.5 inch Smokey Mountain Cooker. I had to replenish the fuel half-way through our cook but that was normal for this cooker. We were happy with the performance and consistent heat from the charcoal. 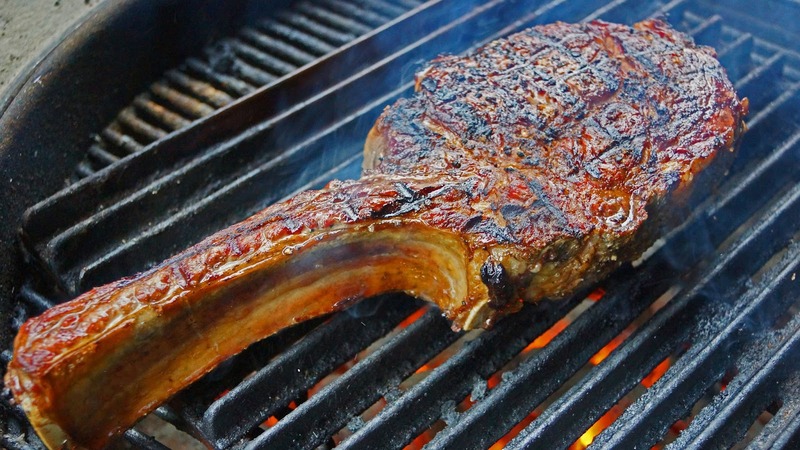 The cowboy steak was cooked over a smoking hot cast iron grate. The heat was great and lasted more than enough time to thoroughly cook our steak. The Weber Briquettes passed with flying colors in the cooking tests. We are very pleased with the performance and longevity of Weber charcoal briquettes. It passed our un-controlled experiment with flying colors. They performed stellar in both of our cooks. We can vouch and would recommend this product. I do have to return to the price of this product. 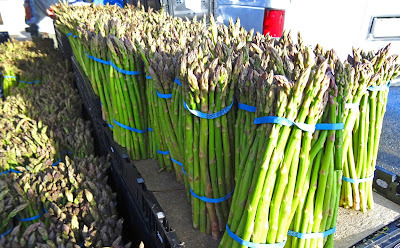 At 20 dollars for 20 pounds the per ounce price would be .062 /oz. (Original Kingsford .051/oz). 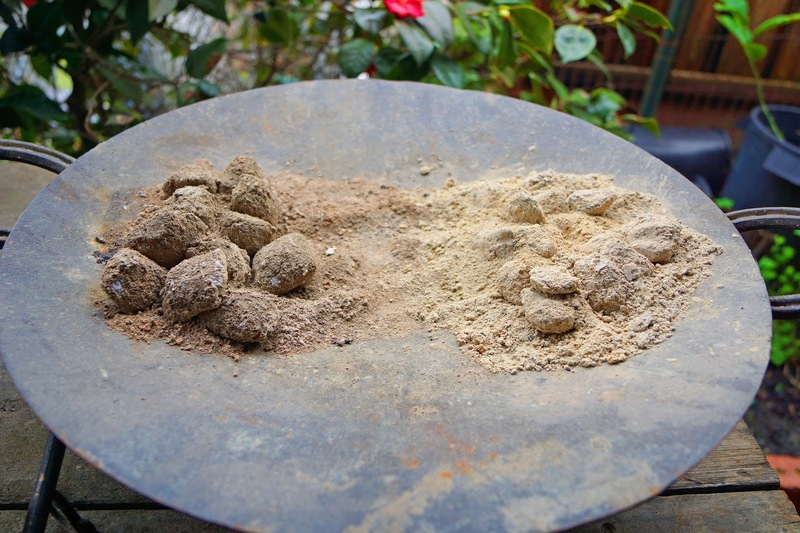 This makes this product a higher priced option in the briquette market. We go through a very lot of charcoal in a season. This may and most likely will affect our purchasing decisions. A Purple Pig Fundraiser for Handicapped and Special Needs Children was held at our local Elks Lodge last night. Our friend Gloria asked us if we would like to attend. She promised us the theme of the evening would be bacon. She was not exaggerating and we would like to share some images with you. We arrived at the lodge to enter into a hall decorated in the color purple. The tables were covered in purple cloth. In fact a lot of the guest were wearing purple. Tonight we feed the Purple Pig. We pork bellied up to the bar and had several frosty beverages. It was time for the parade of bacon to begin. An appetizer station was set up to start of the porky feeding frenzy. Little cups of bacon studded quiche and bacon wrapped Parmesan crackers whetted our appetite. While we waited for dinner, a silent auction of prizes was available to bid for. We also had the opportunity to buy raffle tickets for fun prizes. Ms. Goofy won a fun basket filled with whimsical items. I commandeered the chocolate from her basket. I was looking forward to the main course because I had not had any bacon in several minutes since the last yummy appetizer. The dinner was set up as a buffet line. We started with a bacon broccoli salad that was divine. Bacon will make vegetables even taste good which was proven in the bean dish too.We moved on to a maple flavored sweet potato dish. This was covered with a bacon praline topping. Everybody at our table raved at this dish. Our entree was a mushroom topped pork chop in a cream gravy. This was one tasty meal. Of course no bacon meal would be complete without dessert. 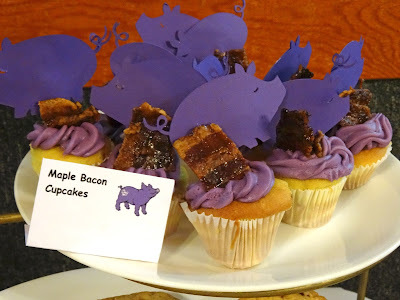 Purple frosted pig shaped cookies, bacon studded sugar cookies and the most decadent maple bacon studded cupcakes topped with frosting and a piece of candied bacon gilded the lily. Gloria, thanks for inviting us. This was a great fundraiser. Where else can you indulge on bacon and do it for a good cause. Good times. 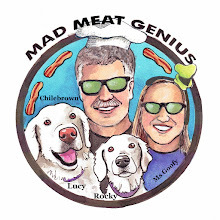 With all the fake news and alternative facts we here at Mad Meat Genius would like to address the bacon shortage. We have shared this Public Service Announcement before but it is very pertinent in these perceived troubled times. Please enjoy.